Following yesterday’s budget, landlords who had been able to offset 80 per cent on the interest they incurred on mortgages were told they could now defer 100 per cent. A 20 per cent increase. Posted in Misc and tagged Ask A Broadsheet Renter at 9:30 am on October 10, 2018 by Admin. REITs pay no tax. Landlords have to have a mortgage to avail of this. Landlords who have HAP tenants get this tax relief anyway. Property tax still can’t be offset against tax bill. A landlord with a 200k mortgage will benefit by around €75 a month. €0 a month for tenants. Because they gave extra money to a group of people who provide very little benefit to society. There shouldn’t be enough profit from owning 3-4 houses with mortgages to sustain a livelihood. Housing should either be owned by the occupiers or by large professional entities (including the state) who run them professionally and efficiently. wait a minute. I thought FG only looked after the vulture funds. Them too. Housing association and vulture funds not the same thing bud. Is it possible to get a professional landlord body that isn’t either a) cynical vulture fund or b) you retired garda type.? That’s easy – the timid state broadcaster is Ireland’s equivalent of Russia Today and parrots whatever it is told by whatever government of the day is in power. Like Ireland’s ” paper of record ” the Irish Times it comfortably inhabits the incestuous and self-serving political establishment where playing by the rules and not biting the hand of the government spin doctor that feeds you is more important than finding out the truth. 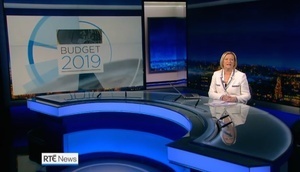 RTE’s Europe correspondent Tony Connelly is Ireland’s performing monkey in Brussels and there’s a whole troop of correspondents back home inspecting the government’s red bottom and picking fleas out of its hair. It’s why the crash happened without warning from the media and all the culprits got away with it afterwards. Ireland really does deserve better. If they didn’t show ads it wouldn’t be so bad. We have to watch ads because they need the revenue to pay millions for soap operas that are broadcast on BBC anyway at the exact same time. Ah here now, I rant in the comments only. You’ll be having me read the news next. Only on the radio though lovey …. I hear you’ve a great face for radio. What the actual flip is this actually supposed to do to address the crisis? If every landlord in the country decided to sell up tomorrow, it wouldn’t change the amount of houses available. If anything, particularly in Dublin, there’s a lot of people who would much rather stop renting and buy a place but the shortage of houses for sale has driven prices up at an unprecedented rate, way out of the reach of most people. Full disclosure, I stand to benefit from this so this is absolutely not sour grapes. “high tax burdens were forcing them to sell up to owner-occupiers.” can fupp off. It’s nonsense. Who are these landlords that either a) managed to maintain their tiger-era investment properties through the low income period of the recession, or b) bought them during the recession, when property costs were low and were comfortable enough to make the investment when the returns were low, or c) bought them pre-tiger when property was cheap AND would be currently paying off a much lower proportion of interest on their mortgages and are only deciding now, when rents are skyrocketing, that it’s no longer economically viable? Anybody who’s telling you that is either lying for personal benefit or is so unbelievably bad at business that they probably should just sell up to owner-occupiers. Careful now love, you know how long it took to get those replacement dentures the last time eh? I know, I know. But it’s like a reflex at this stage.